Good Shepherd’s Ministry (GSM) in Mongolia is a nonprofit ministry started by Currey Creek’s own Beckett family (David, Kim & Eva). Currey Creek began a strategic partnership with Pastor David Beckett and GSM in 2014. The Mongolian Christian church is a first generation church growing quickly but lacks biblically literate and spiritually mature leaders. 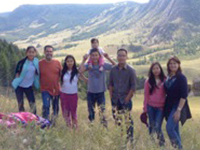 GSM’s mission is to transform the Mongol nation by sharing Jesus' compassion for people and discipling future leaders. Located in Ulaanbaatar, the capital of Mongolia, this ministry is predominantly discipling Christian young professionals (YPs) through mentoring relationships and outreach. Pastor David has a M.A. in Biblical Studies from Dallas Theological Seminary (DTS) and is ordained as a pastor by Currey Creek. Kimberly is a licensed US attorney and holds a certificate of Biblical Graduate Studies from DTS. Mongolia is a lone democracy land-locked between the two giant nations of Russia and China. Mongolia is a nation rich in natural resources. Mining is creating a new economy in Mongolia and many YPs are trained in Korea, China, Russia, USA and Europe to lead this new economy. Pastor David’s relationship with Mongolians began with ministering to exchange students in Korea at Handong Global University. Many of these English speaking exchange students return to Mongolia as Christians excited about the opportunity to transform Mongolia with the Gospel of Jesus Christ but meet opposition from the Buddhist culture and often feel alone as a minority and without Christian leaders to disciple them. Currey Creek is partnering with GSM in Mongolia by sending Biblical teachers and mentors to teach pastors, church leaders and YPs.